And of course, the race takes us along the coasts of pre-history where mankind’s first empires were founded, as well as its last and most long-lived, The Empire of The Ottomans. I found SOL, thanks to the persistent insistence of our fellow competitor psail (you can blame him!) in the Summer of 2013 and the Turkey Tour that year was the first SOL race I ever entered. 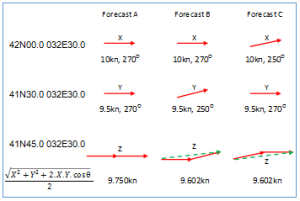 I had done a bit of on-line sailing before on a site that had adopted a step-function approach to modelling wind by dividing planet Earth into little (well big enough – 1° x 1°) squares and then imposing a single wind vector across the entire square for a not so little period of time (12 hours), and then stepping our model yachts across the squares at 10 minute intervals. SOL was different and difficult and that race around Turkey was mad. I confess I wasn’t sure if SOL was going to be for me and my initial reaction was to return to racing-on-squares, where course changes were limited by the design of the game to those couple of occasions when you crossed a line of latitude or longitude and 08:00 and 20:00 CET when there would be a – usually major – windshift. Except of course, on those other occasions when, either side of a boundary, you had convergent/divergent wind from astern or a-bow, in which case tacking or gybing regularly along the line could pay dividends! Mad too, really! But I became a SOL disciple. That first race I started late (as you do) and I went aground (later I learned this was known as a BBQ; a regular word in Chat that initially confounded me), but I got round. I didn’t race Turkey last year; so this Time was my second attempt. I was pleased I did better! After last year’s Turkey Chase, NZL_Scotsman published an outstanding report on how he achieved P3 against the – as always – redoubtable competition. It’s well worth a read. It’s still there, which, as it happens is one of the pluses of solfans.org – just like Facebook there forever. So, let me propose a new tradition: in future, all 3rd place finishers in the annual Turkey Chase shall publish a narration of their voyage on solfans.org. By edict: bonknhoot. Scotsman in last year’s report divided the race into three sections: The Black Sea, the Sea of Marmara including its entrances either end, and the Med. I’ll do it differently and focus instead on my mistakes, many more than three. I’ll use the graphs from hmm’s excellent data center to illustrate them, and kenza (why not? ), Scotsman and Franci as my references. Here goes. Leaving Hopa there really was only one way: North East, close-hauled in order to get you into the stronger breeze mid-sea. 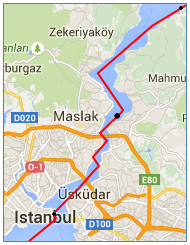 You can see bonk (red line) and kenza (blue line) following much the same track. The black dots are the hourly positions. However, there are subtle differences; bonk pinching up initially before straightening out onto a constant CC course, but kenza sailing free-and-fast into a leeward position. Up until H3, there was little in it, but then I went for a pint with my stepson, leaving bonk on her constant CC course. Mistake #1, since when I came back, bonk’s TWA was 60° plus, too free for too little extra BS, and kenza had availed of the lift to come up towards bonk. The wind then started to move round from the East into the North as forecast (funny that! the forecasts on SOL are always right), and when we tacked, kenza was marginally ahead. We were now sailing due East, making very good VMC in good breeze in each other’s good company. Further ahead an opportunity to tack on a heading bend to get inside what would later reverse and become a lift presented itself. I went for it – Mistake #2 – kenza, plus all the others who got to the entrance to the Bosporus ahead of bonk, carried on, curving South on starboard. There was more breeze further North, so their choice seemed to make little sense and the last WX (possibly not the last WX issued!) I had routed had advised the tack. However, wrong QtVlm was, because the guys who carried on, when they started to lift again were freed much more than bonk (back on starboard further North) and at H28, bonk was placed in the early 20s and kenza was in the lead; a lead which he never relinquished. But one thing about bonk; his skipper never (well, rarely) gives up, so that as the wind became more fitful and place after place was turgidly regained, by H60 bonk had passed NZL_Scotsman and was in the T10 for the first time, so to commemorate the event I immediately made a further mistake (Mistake #3), putting in a series of gybes to hold up North in more breeze rather than sail hot into less wind but into more favourable angle. Scotsman passed me back. You can see our tracks below; bonk is in red again, and this time blue is NZL_Scotsman. Note also the two series of gybes that we both put in earlier. 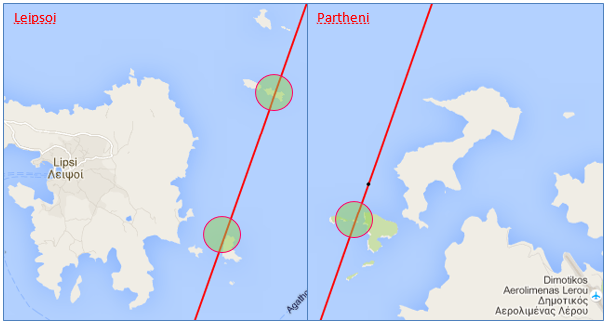 You will find that if you check it on a chart, these are along the 42nd parallel. This has all to do with vector interpolation. You do not need to run a router to appreciate this, but just to be aware of what the data density of the wind grib is: the grid of the grib! In this race as in many others the grid used was a mesh of 0.5°; in other words the data in the grib file is limited to a TWS, TWD pair at every 0.5° interval of latitude and longitude, and further limited to data every 3 hours of course. 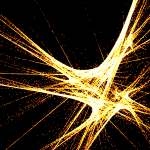 Everything else in between is interpolated, i.e. estimated using a bit of maths. Trouble is there are different ways of doing this estimating. One very logical way is to think of it as vector averaging and this is what the SOL interpolator does. OK, so averaging is simple, right? Say, down a meridian, I have TWS 9.5kn at 41.5° latitude and TWS 10kn at 42°. In the middle in between, the simple average would 9.75kn. Right? No! Only if TWD at both positions is the same, otherwise… using vector averaging, the result will be less than 9.5kn! Perhaps the diagram above right explains. Now, off course, interpolation is more sophisticated than arithmetic averaging; interpolation smooths out jagged segments into smooth curves, be those segments single simple scalar values or more cerebrally vectors. Nevertheless, using a vector approach to interpolation tends to emphasise TWS peaks at grid points and with vector interpolation you will never find a peak TWS off-grid. Just by the way. 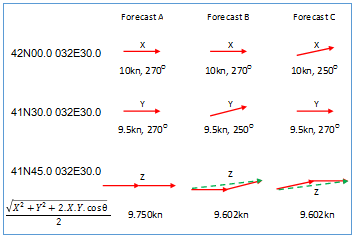 Know you angles (work them out or look them up in WXinspector or spinacer and write them down). Possess perfect timing, in order to minimise your number of tacks and the associated performance loss (count down or use the DC editor; set the predictor dot at 1min = 0.017 hour as a guide). Be able to estimate the trade-off between loss of VMG and avoidance of two tacks/gybes (Performance Loss = BS in kn ∕ 200, VMG = BS x cos TWA). Everybody near the front of the SOL fleet knows how, and since the Bosporus passage took no more than two hours, nothing happened. 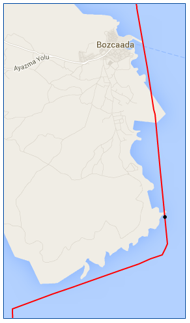 However, once we cleared out into The Sea of Marmara, it was time for bonk Mistake #4. Again, IRL it was pub time, and stepson who was visiting us for the weekend inveigled me once more. So, as Scotsman and I put in our last two gybes to clear the Kennedy Quay (another one) in Istanbul, I left bonk on a downwind running TWA, which would curve her gently into the open sea and onto the rhumb for Gallipoli. Scotty appeared to be doing the same. But when I returned to my screen, he and the rest of the T10 had hotted up to hold North where more pressure was starting to emerge. Oops, I corrected, but the damage was done. Approaching the entrance to The Dardanelles, nothing much had changed since leaving Byzantium behind us; kenza was leading from DikkeHenk but not by much, and Scotsman remained that bit ahead of bonk. It was 02:00 CET in the morning as the leaders started to enter the narrows, and unfortunately for some of those who, either as a matter of principle or for the sake of matrimonial harmony or because they simply love a challenge, trusted in their DCs to take them safely through, it proved a costly passage. naccr, who does this sort of thing more often. Scotty and I were now P5 and P6, with less than 1nm between us, and two days of slaloming through the islands coming up. We were well matched, and the only thing of note that happened was my Mistake #5 rounding – uh,uh clipping – Bozcaada. Let’s see can we get a close-up from hmm’s wonderful site? Yes, there it is. So, what happened? Well, I like to round by DC (idiosyncrasy of mine), and it looked like my DC was going to execute a little late so I overwrote via the commander. Bang. Perf down to 80%. Gybe coming up. Keep perf below 93% and it will be free. Perf back to 95% as gybe approaches. Bear off to 179 TWA and perf drops to 93.2%. Damn. Fluster fruster! Should have luffed up to shed some more speed but panic gybe instead. Too early!! And of course perf drops further to 88% or so. All so pointless and costly! We carried on. Round Babakela on the mainland, then inside Lesbos past its capes Skamniá, Tomári, Machaíra and Agreliós back into more open water heading for the Díavlos Chíou (which perhaps translates as Devil’s Strait, which would be ironic, see later) between Chios and Turkey. Rounding Agreliós the wind moved onto an angle between abeam and astern which IRL I guess would have you wondering which foresails to set (gennaker, spi, blooper, whatever), which in SOL translates into a concavity on our Mono90’s polar diagram and an opportunity to hop between faster TWAs either side of the concavity. Below you can see bonk’s and Scotsman’s tracks and that bonk hopped and Scotsman didn’t, which suggests to me Scotty had gone to bed and pragmatically set a straight line course that would be more sure to clear Inousses and more importantly Passas island. It was H97 in the race and in KZ-land (remember the old IYRU codes; KZ stood for Kiwi’s snooze when we are awake, KH for Kong Hong, KC for delight, KK for Kikuyu’s, etc), it was quite the middle of the night and Scotty harpooned Passas. You can see how it happened. His change of course after passing Karaburun was late and a rhumb line that would have got him clean to Beyaz Burun now brought him grief. I’d like to think I would have freed him off had I known his password, but probably he had another friend who did, because he certainly wasn’t stuck for long. Unfortunately, self-, friend- or foe-set, the new course took him into more trouble, and this time at c H98½ it proved to be a more costly bit of faulty navigation, as he BBQ’d a full hour and a half at Beyaz Burun. Sailing on into the Ikarian Basin, a submarine trough between Chios and Samos, my attention switched to Franci, about three quarters of an hour ahead of bonk in P3. 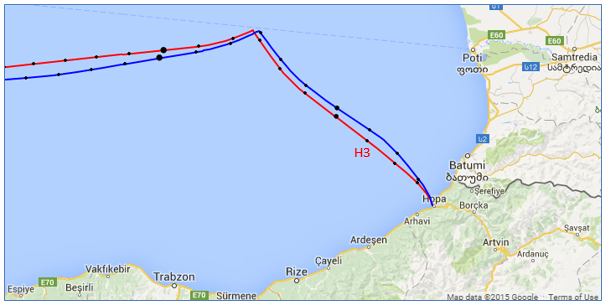 The next extract from hmm’s analysis site now compares bonk (still in red) and Franci (the new blue track). There was only one way to go. Hold West on a gybe approx due South to enjoy stronger breeze, and delay approaching Samos on port gybe more than you would normally do, despite the fact that you would get a big lift (opposite to what you want going downwind) as you came in. Franci ahead obviously enough gybed first, and I decided to gybe inside him. Initially my constant optimum VMG TWA curve was going to rake bonk past the northern coast of the island, but as the wind dropped, tighter TWAs were needed and bonk was starting to curve well North. Mistake? Hmm… It was a hell of a lift, so there was only one thing for it: tighten up onto a CC towards some arbitrary (well, where the curve flattened out) gybe point. I don’t think it made much difference, but it wasn’t any slower than Franci’s approach. 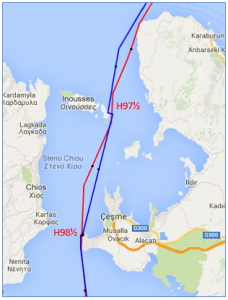 It was once again well past midnight as we cleared Samos and Karakol Point on the mainland. I badly needed some sleep and quickly checked where kenza in the lead was going, entered a CC to follow him (sensibly back out into the Aegean to catch the rather gently blowing Meltemi), noted it was impossible to clear the SLIs in the gap between Leipsoi and Partheni, set an alarm and went to bed. Whatever woke me, it wasn’t an alarm. New-fangled android device. Mistake #6. You have to re-set the date as well as the time! Bloody Hell! Rush to the puter. BS? positive. Ranking? P5. Track? See screenshots! UTC? 04:30 (my inner alarm, huh!) or H110½ on the race clock. Compass Course? still 237.6°. TWA? c 115° (middle of one of the polar dips). 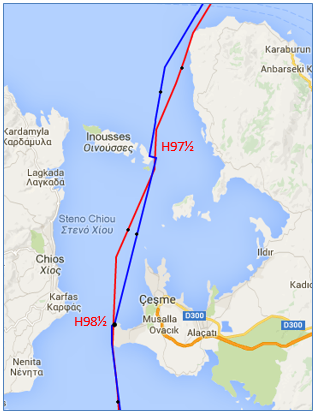 Course to Goal (southern tip of Rhodes) c 120°. So, OMG, I had SLI-eep jumped, but nevertheless had lost more than half an hour sailing in the wrong direction, instead mind you of an hour and a half enjoying a BBQ, as well as a place to MikiCe in the process, and I corrected. 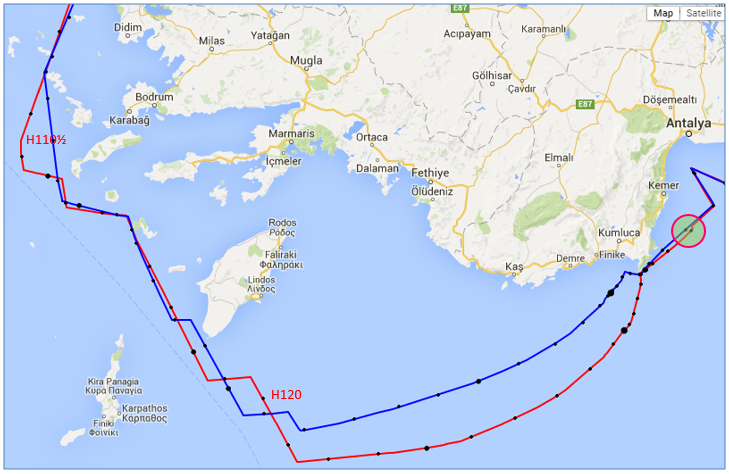 It was the same story as further North in the Aegean 12 hours earlier. Gybe South West in the breeze and come in into another big bad-assed break at some stage after passing Rhodes. TWS and TWD were steady, so I entered a few DCs, got some more sleep, and set another alarm this time same-day, so I’d be awake for calling the final gybe in towards Yardımcı Point and behind it the offshore mark at Antalya. I am not sure what happened to MikiCe, but when I awoke bonk was back in P4, slightly less than an hour behind Franci, one and a half behind Dingo in second and two behind kenza, our never flagging leader. Nice surprise re P4. Less nice though was that Franci was already gybed and heading in, and had been since an hour earlier (roughly since H120, 5 days out from Hopa, pretty much as prompted by Qt’s routing) and that Dingo had also gone. Even more disconcertingly, kenza was continuing to continue on South East to almost beyond square to Yardimci. I gybed! And this was not Mistake #7. On the contrary; kenza threw away an hour by delaying his gybe, Dingo got nervous and luffed up to cover Franci, and Franci in turn had gybed too early and got bent down into Finike Körfezi, the bay West of Yardimici, so that his lead on bonk reduced to minutes and Dingo’s to a fat quarter of an hour. bonk, however, cleared the point. Every dog has his day, Dingo. In P3 for the first time, I immediately made a mistake, a little one, but nevertheless Mistake #7. Simple finger trouble led to an unplanned gybe and back for a nice bit of perf loss. Franci went P3 again. But at the mark, it was neck-and-neck once more and bonk rounded tighter putting herself back into P3. We were now approaching the Cilician Sea, so called after the ancient, rarely independent country providing its northern coastline, which despite excellent natural topological defences in the form of the sea itself and the Taurus mountains North and East of it, over the centuries and millennia has been occupied by empire after empire; Hittite, Hurrian, Assyrian, Persian, Roman morphing into Byzantine and finally Ottoman. But back to the race and more downwind work, and a further and final bonk blip. Mistake #8 was a relatively simple matter of sailing too deep and fair a curve on starboard gybe when a straighter line to the gybe point would have been better. Advantage Franci once more. As we hit 36º North ahead of rounding Anamur, it was back to gybing down a parallel again in order to stay in max pressure. And it was H154 and getting late. I set some DCs to keep bonk gybing down the parallel and bagged some more (two hours!) sleep. I don’t know what Franci did, but based on his track I suspect he did not set DCs, but did fall asleep, to take a fatal excursion South. Some way off İncekum Burnu it was time for a final gybe and as we crossed the open sea, we slowly got to within 6 hours from the finish in the bay off Iskendrun and fabled Antioch, one-time seat of the first bishopric of the Catholic Church. The predictor lines could now show bonk the way in, although a final late morning WX was still adding a modicum of uncertainty. You don’t see this very often, but the constant TWA and constant CC predictors starting from the same heading were both going to take bonk to the line, but the constant TWA line, wavy and longer though it was, was going to get her there up to 10 minutes early. So, I sailed the waves!